While Burgundy, Magenta and Blue waited for their supper to arrive, they began a quick game of Bellz!, the “Feature Game”. This is a very simple manual dexterity game, albeit one that is very well presented. The pouch opens out to form a soft bowl containing bells in four different colours. Each colour includes bells in three different sizes; the aim of the game is to be the first person to have picked up all the bells of just one colour using the stick which has a magnet in each end. On a player’s turn they can pick up multiple bells or chicken out and stop at one, but if they pick up any bells that don’t match the colour of those they have already collected then that turn is forfeit. It is certainly more difficult than it looks and there is a little bit in the way of tactics as the magnetism gets weaker further away so with skill it is possible to daisy chain bells and only pick up certain bells. There is also a strong magnet one one end of the “wand” and a weaker one on the other. Th rules are not completely clear (and are completely in German in any case! ), and gamers inevitably ask whether the bowl can be moved and how much shaking is allowed, which were things we house-ruled. We had had about two turns each when Green arrived and joined in. Food arrived and we were still struggling so we carried on as we ate. Burgundy ran out the eventual winner with Blue following close behind leaving Magenta and Green to fight it out for the last bell. Grey and Cerise promptly turned up and, as it is an eye-catching game, also had a go with Cerise taking the honours. Karuba (a tile laying, path making game that is suspiciously similar to Das Labyrinth des Pharao, a game picked up on behalf of Black and Purple who had seen it at the UK Games Expo back in May). There were also older games, some of which we’ve been interested in for a long time. For example Rockwell was a big game at Essen two years ago, and Green and Blue have expressed an interest in both at the time and since. Somehow either the price wasn’t right or it wasn’t available at the right time, until now when a good deal beckoned. Blue and Pink picked up a number of small games as well. These are often hard to get hold of except at places like Essen and are sometimes a hit, and sometimes not so popular, but as they are relatively inexpensive and take up little space in the luggage, they are what makes the fair special. Finally, there were the promotional items, extra copies of which Blue handed round. Eventually we decided it was time for a game, and with six the decision is always whether to split into two groups or not. Green suggested Eketorp for six, but Blue really wasn’t keen, so eventually we opted for Codenames, a new social deduction team game based on the meanings of words which had received a lot of good reports before Essen. Green pulled a face at the idea of “a word game” and Burgundy commented that social games were not really his thing, even Blue who bought it wasn’t terribly keen because it had sounded un-promising when she read the rules. Cerise was almost enthusiastic though and Magenta pointed out that it shouldn’t take long, so we gave it a go. The idea is that there is a grid of twelve cards and the players split into two teams, with even numbers of male and female, we did the childish thing and played boys vs. girls. The leader of each team is the Spymaster, and as Grey had popped out for a second, we volunteered him to be one so it was natural that Cerise should be the other. The Spymasters’ job is to get their team to reveal the cards/words that correspond to their team of “agents”, by giving clues. The clue must be a single word followed by a number which reflects how many words are indicated by that clue. For example, the clue, “trees: three” could be used to indicate the words “oak”, “ash” and “elm”. Members of the team then touch cards that they think are their agents; they must indicate at least one, but may try up to one more than the number in the clue. The Girls started off badly finding a neutral and the Boys started off well quickly getting a three card lead. Before long, the Boys started to get a bit stuck with movie clues and the Girls began to catch up. As Magenta pointed out afterwards, it was important to listen to both the clues and the discussion of the other team as you can get extra clues. And so it proved in the end. With the teams tied, the clue was “Regents; two”. Blue and Magenta misheard and thought Cerise had said “Regions”. The Boys struggled on their turn too though, and suddenly the Girls had another chance. When Green had repeated Cerise’s clue during the Boys’ discussion, Blue had suddenly realised the Girls’ mistake and they were able to find “Park” and close out the game. Although it is not really our sort of game, everyone was very complimentary about it and as a group we enjoyed it much more than we thought we would. We could all think of people who would like playing it and now that we know how it works, it would be much quicker to play next time too, making it a surprisingly fun filler with the right group. With that done, we had to decide what to to play next and, with too many for Cosmic Encounter, inevitably Eketorp was raised again. Grey was very enthusiastic, but Blue really wasn’t keen, especially as it can drag with six players. Much to Blue’s delight and eternal gratitude, Magenta tactfully suggested that, despite being a Viking, she could play something else with Blue and Burgundy. With that, Green happily started explaining the rules. Eketorp is a game where players attempt to gather resources to build their Viking stronghold on the Swedish island of Öland. In this game players try to second guess which resources the others don’t choose, with a battle and a potential extended stay in the hospital as the reward for failure. The game itself is played in several rounds. First material is distributed across the board according to the card revealed at the start of the round. The players then decide, in secret (behind their player screens), which areas to send their Vikings to. Vikings can either go to one of the seven resource or brick areas, reinforce the defence of their own village, or attack one of the other players’ villages. Players then reveal their choices and place their Vikings on the central board. Depending on how the various Vikings meet, peace may be preserved or battles may ensue. Vikings on a material field live in peace if there are sufficient building bricks, i.e. there is the same number of building bricks (or more) than there are Vikings wanting them. If there are insufficient bricks available, then there will be a battle. Battles also take place on a siege field in front of a player’s castle for the right to lay siege if several Vikings are positioned there. Battles always take place in a particular order. Firstly, the starting player engages in a battle, then everyone else takes turns until all battles and sieges have been resolved. Battles are fought using cards chosen from a starting hand of four. Each player choses a card in secret and then they reveal them simultaneously with the highest card winning. The difference in value between the two cards determines the battle difference which indicates which area of the hospital the loser ends up in. In the case of a tie, both parties go to the hospital. The clever bit is that once a battle has been fought, players swap cards and place the new card face down in front of them. Once a player has played all their cards in battles, they take the cards in front of them to form a new hand. In this way, the game is self-balancing so that a player who has a bad card draw at the start will have a better hand later in the game and vice versa. If village siege is successful, then the attacker gets to pillage bricks from the village wall. Bricks may only be taken from the walls that are two bricks high and the total point value of the bricks taken may not exceed the battle difference. Bricks can only be removed from top to bottom and the attacker can then take one of these bricks home (with the remainder going back into the reserve). Once all battles have been resolved all the winning Vikings can take their bricks home and add them to their village wall. Each wall comes in six parts and a maximum of three bricks can be stacked in each giving a maximum of eighteen in total. Once a brick has been used, it cannot be moved at a later date. The bricks are nominally made of different material and are worth different amounts at the end of the game (green, or grass is worth one whereas grey or stone is worth four for example). 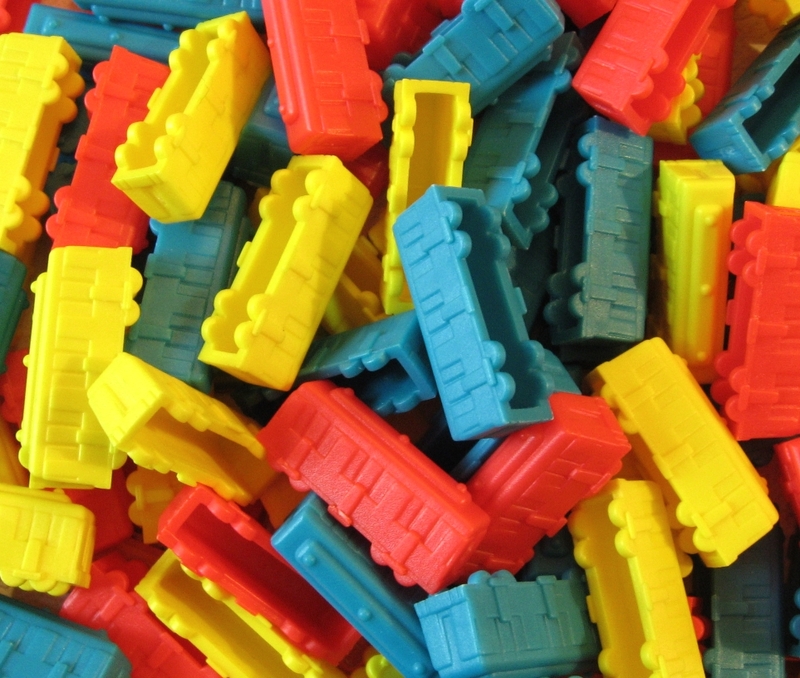 The end of the game is triggered when one player reaches the maximum of eighteen bricks. At the start, with no village walls to attack or defend, and all Vikings fit and healthy, the central resource pools were particularly busy places. After many attacks and counter attacks, eventually all were either victorious and claimed resources, or were licking their wounds in differing levels of the Viking hospital (talk about a beds crisis!). Green took the early lead at this point. Round two was much quieter, with less than half the Vikings available to go brick hunting, so everyone was relatively successful with their choices. Over the course of the next couple of rounds, the game board became more crowded and there was even the odd cheeky raid on a village. By this time, Grey had managed to create a nice evenly built village wall, one or two bricks high made up of both grass and wooden bricks (worth one and two points respectively) – easy pickings in a fight, but less threatening too. Green was a bit lopsided, concentrating on building with a range of brick colours mostly on one side in order to limit the attack directions. Cerise however had quietly managed to built quite a good wall round a large part of her village with a lot of clay and stone bricks (worth three and four points). So, the next two rounds were characterised mostly by Grey and Green attacking for Cerise’s wall. The first attack by Green was successful, but only enough to nab the top green brick, hardly a dent at all and netted only one point. Grey’s attack was a stalemate. In the final round, Cerise found herself surrounded on all sides with Green and Grey attacked from one side each. Again only Grey was successful enough to break down part of the wall though. Then for the final battle of the game, Grey and Green had to go head to head for the right to attack Cerise from the third side – it was a draw and Cerise was safe! As Cerise was the only one who had managed to build a wall at least three high all the way round she picked up the five point bonus and proved herself the superior Viking with a score of forty-four leaving Green and Grey some way behind, fighting it out for the wooden spoon. In the end, Grey decided he didn’t like the game after all, because had Cerise beat him! Meanwhile Blue, Burgundy and Magenta conducted a brief audit of the games available and Burgundy’s eyes lit up at the idea of trying out the new Ticket to Ride Map Collection as he had played a lot of Ticket to Ride and prided himself on being quite good at it. Magenta is also no slouch either however, and was also keen as she had won her last three games of Ticket to Ride: Europe. 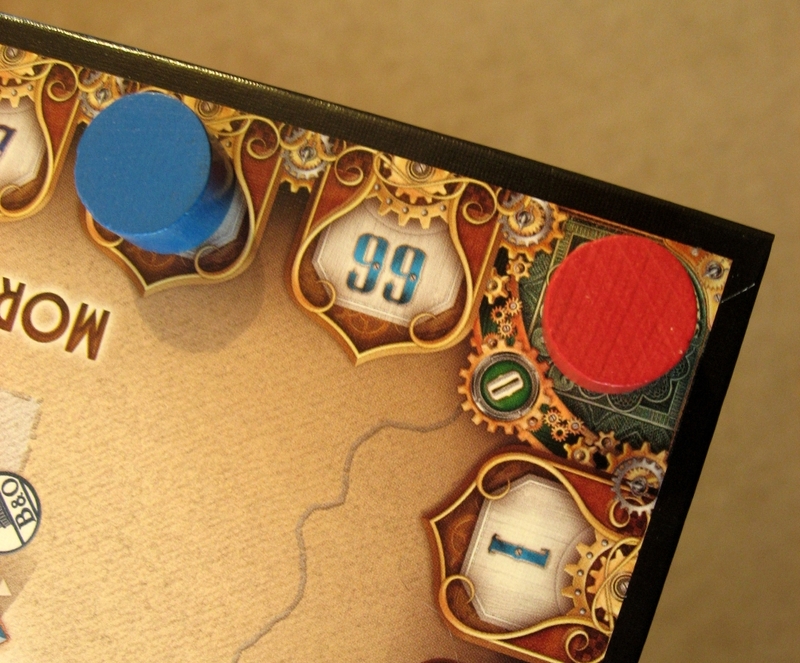 Similarly, Blue has slightly unjustly acquired a reputation for beating people at Ticket to Ride, and although she hadn’t played it much recently, she had won her demonstration game at Essen and had enjoyed it too, so was very happy to give it another try. Although everyone was keen to try the UK map, to avoid giving Blue an unfair advantage, the Pennsylvania side was chosen. 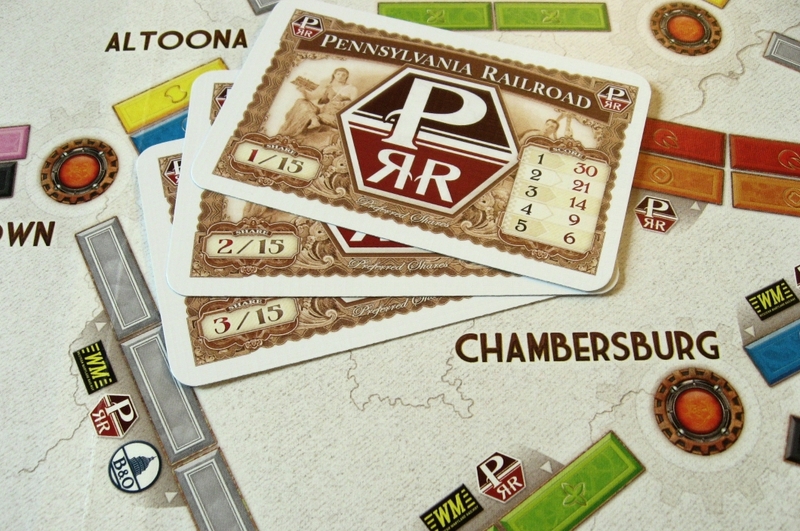 The seven car route from Cumberland to Baltimore engendered a lot of discussion, as there aren’t any routes of that length in Ticket to Ride: Europe. Burgundy was fairly sure they were worth eighteen points in Märklin, but the increase in points from six to seven cars seemed very uneven compared with the change from five to six cars. In the event, it didn’t make much difference, but checking the rules online later confirmed that Burgundy was right and it should have been eighteen. Burgundy was quite pleased with his starting tickets getting three east-west routes that he thought could largely be coincidental. 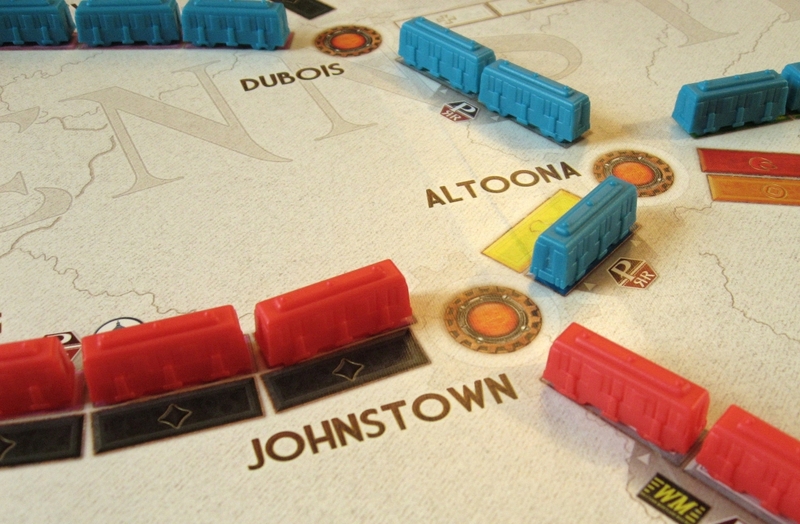 His delight faded to despair, when in the first turn, Blue took the route from Altoona to Johnstown and quickly followed it by adding the Altoona to Dubois, in quickly completely scuppering his plans. 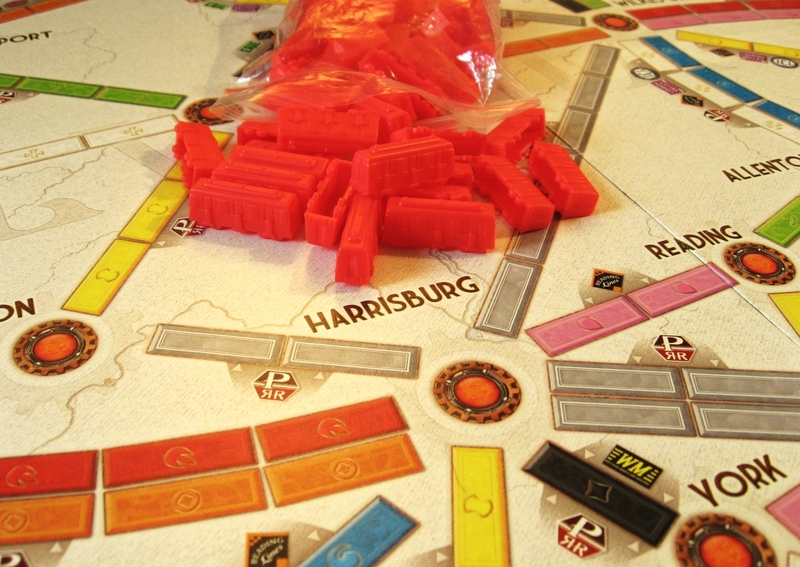 Magenta was equally unimpressed that double routes were not in use when Burgundy and Blue quickly completed all the connections to Johnstown rendering one of her tickets impossible within the first few turns. From there, the game quickly descended into a knife-fight in a phone box with everyone scrabbling to make their starting tickets and it looking very much like nobody was going to succeed. As Burgundy pointed out though, tickets were not going to be so important in this game as there were a lot of points available from the Shares. This is a new feature specific to this map. The idea of these is that most routes also have one or more company logos shown next to them on the map. When these routes are completed, players choose which company they would like to take a share certificate for. The companies are different sizes with some companies having a lot of certificates available while smaller company others have fewer. 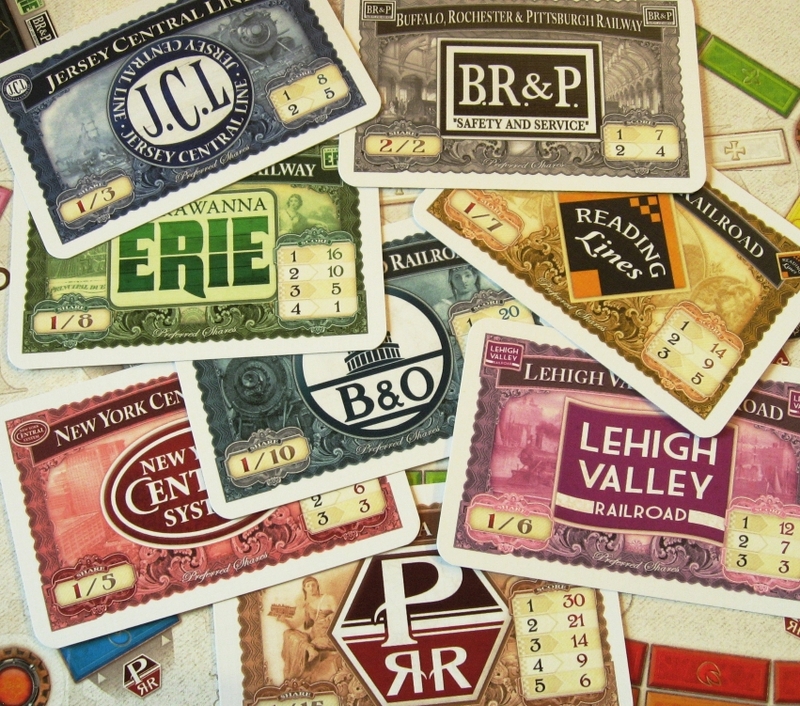 At the end of the game, each player’s stock holdings are evaluated and points awarded. The bigger companies are worth more points, however, it is harder to get the majority stake in these. In the case of a tie, the share certificates are numbered and the points go to the person with the one taken first. The shares certainly did have a massive impact on game play. Normally in Ticket to Ride, players achieve their first routes and then start picking up tickets, trying to maximise the number of longer routes as these give the best points return for the cards and trains, but, that wasn’t how this game went. Although Blue bravely picked up some more tickets and was promptly followed by everyone else, this was the only time anyone did this as everyone got in everyone else’s way so much it was just too risky. Since achieving tickets was proving so challenging, everyone started trying to pick up share certificates which meant building small routes as these were the cheapest and easiest way to get them. Then suddenly, Burgundy declared he was out of trains and the game came to a quick end which only left the scoring. Although Burgundy had moaned about how badly he had done, neither Magenta nor Blue realised just how badly until it came to scoring tickets. It’s true that the first ticket scored him ten points, but all the others were incomplete losing him nearly all the points he had accrued from placing trains. Magenta also had a ticket she had failed to achieve, but it hadn’t cost her nearly so dearly. Blue on the other hand had somehow managed to make all her connections and therefore also picked up an extra fifteen points for the Globe Trotter Bonus. Unfortunately for Burgundy, although he had done well on the shares, the horror-show that had been the tickets had put him right out of contention and he was nearly lapped (though not quite!). Although Magenta had shares in more companies, the combination of the extra tickets and the fact that Blue had managed to hang on to the majority in a couple of the larger companies made the difference. Blue finished on one hundred and ninety eight, just over thirty points ahead of Magenta in what was a very tough game. With Grey and Cerise gone, that left us with time for a quick filler to finish. 11 Nimmt! and Deep Sea Adventure were both in the frame, but Green liked the sound of Qwixx, which had been nominated for the Spiel des Jahres in 2013, but was beaten by Hanabi. The game sounded interesting though there was very little to it. On their turn, the active player rolls six dice, four coloured and two white. 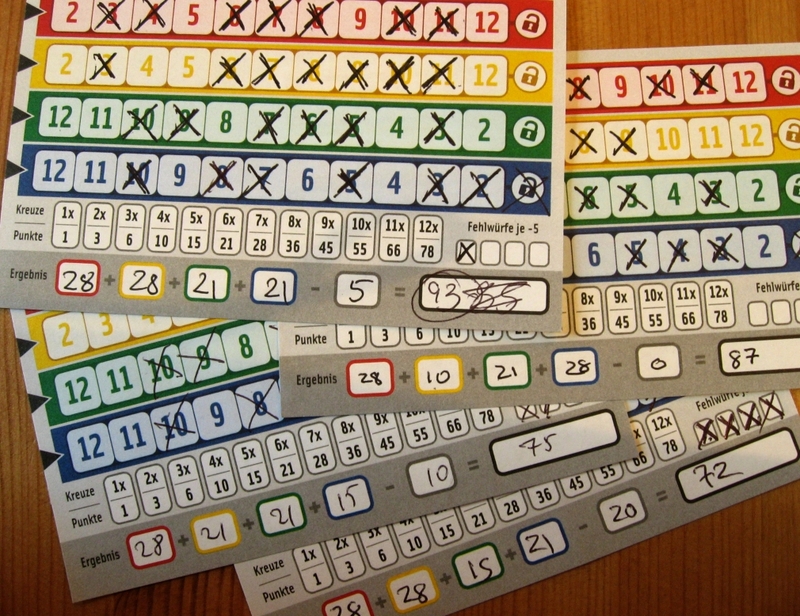 Each player has a score sheet with four tracks: the red and yellow tracks go from two to twelve and the blue and green tracks go from twelve to two. Once the dice have been rolled, all the players may cross off a number of any colour that corresponds to the sum of the white dice, if they choose. The active player may additionally cross off one number corresponding to the sum of one of the coloured dice and one of the white dice. They can choose which of the white dice they are going to use, but the die colour must match the colour of the track. The snag is that players must progressively cross off numbers to the right, i.e. once they have crossed out the red five for example, they cannot go back and cross out the red four. Also, while all the other players can freely choose whether or not to use the white dice, the active player must cross out something on their turn or take a penalty (minus five at the end of the game). Finally, if someone wants to cross out the last number on any track (twelve for red and yellow, two for green and blue), they must first have crossed out at least five other numbers on that track, at which point the die corresponding to that colour is locked and the colour is closed for all players. The game ends when two dice have been removed from the game or when one player has accrued four penalties. Scores are awarded for the number of crosses in each row according to the triangular number sequence also used in Coloretto (one, three, six, ten, fifteen, twenty-one, twenty-eight, etc. ), so every additional cross is worth an ever increasing amount. The game started with everyone being very cagey and not taking the option of scoring the white dice as they were too high, but eventually, some people were braver than others and different patterns began to emerge. Initially, the game looked very promising with the potential interplay between different effects, like the probability distribution for two dice, balancing the high scoring potential with not getting stuck and picking up penalty points. Blue was even wondering whether it would be necessary to get another scoring pad. However, being gamers, we all played to a very similar strategy and, before long, the inevitable happened, with everyone stuck waiting for the most unlikely dice rolls (two and twelve). As a result, Burgundy who got there first started picking up penalties closely followed by Green. The game ended when Burgundy picked up his fourth penalty point and we added up the scores. Magenta, who had only taken the one penalty finished five points ahead of Blue with Burgundy and Green nearly twenty points behind thanks to all their penalties. And then the inquisition began. We all really like the game at first because of the way the probability interacted with the constraints on number selection, however, we quickly found that it felt very random because the game was self-balancing. As their game finished, each player was going to be hoping for lucky dice rolls. Since twelve and two are relatively unlikely which would have a delaying effect, during which time, anyone who had not got quite as far was going to be able to grab a couple of extra crosses. The random nature of rolling dice meant that ultimately, the effect of any strategy or tactics applied during the game were vastly outweighed by the randomness of the dice at the end. Although we felt it was probably a good game for children to have fun with, as a game, it was very surprising it was nominated for the Spiel des Jahres. Learning Outcome: Sometimes it is good to play games outside your comfort zone. This entry was posted in Games Night and tagged 11 Nimmt!, Bellz!, Camel Up, Camel Up: Supercup, Codenames, Coloretto, Colt Express, Colt Express: Horses & Stagecoach, Cosmic Encounter, Das Labyrinth des Pharao, Deep Sea Adventure, Eketorp, Food Chain Magnate, Hanabi, Inhabit the Earth, Isle of Skye: From Chieftain to King, Istanbul, Istanbul: Mocha & Baksheesh, Karuba, Keyflower, Port Royal, Port Royal: Ein Auftrag geht noch..., Quixx, Rockwell, The Voyages of Marco Polo, Ticket to Ride, Ticket to Ride Map Collection: Volume 5 – United Kingdom & Pennsylvania, Ticket to Ride: Europe, Ticket to Ride: Märklin, Tokaido, Tokaido: Matsuri, Tzolk'in: The Mayan Calendar on November 2, 2015 by nannyGOAT.